BEST VALUE - The NCV-4000 disposable adhesive surface electrodes are pre-gelled and come with a light weight flexible PVC wire terminating in a touch proof connector. The high quality 10mm round recording disc and solid gel design ensures low impedance for optimal signal quality. 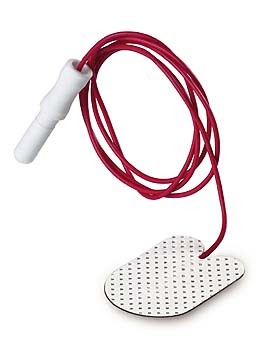 The electrode pad is made of a soft flexible material that minimizes patient discomfort. Solid gel and cloth backing is very reliable when repositioned numerous times. Sold in pouches of 30 pieces; packaged in 10 individually sealed sets of White, Black, and Green. Single patient use only. The NuTab (LTP-1000) is excellent for G1/G2 recording. 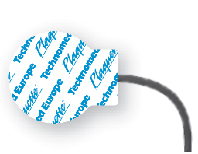 The clear backed electrode has a small circular recording area equal to that of a 10mm disc. Recommended for active and reference for NCV, and for reference during monopolar EMG. Requires reusable alligator clips. Single use only. The CA-310, CA-510, and CA-610 are the perfect ground electrodes for use with the Kendall NuTab. The large surface area ensures the best contact for ground. Requires reusable alligator clips. Single patient use only. Plaquette disposable adhesive surface electrodes are pre-gelled and come with a light weight flexible PVC wire terminating in a touch proof connector. The high quality silver/silver chloride conductive layer ensures low impedance for optimal signal quality. 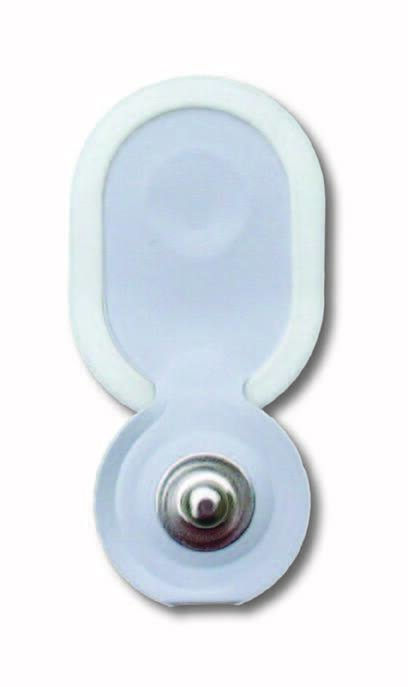 The electrode pad is made of a soft flexible material that minimizes patient discomfort. Small gel-free tab serves as strain relief and makes repositioning quick and clean. Sold in boxes of 40 pieces; packaged in 10 sets of Red, Blue, Green, and Black. Single patient use only. Plaquette disposable adhesive ground electrodes are pre-gelled and come with a light weight flexible PVC wire terminating in a touch proof connector. The high quality silver/silver chloride conductive layer ensures low impedance for optimal signal quality. 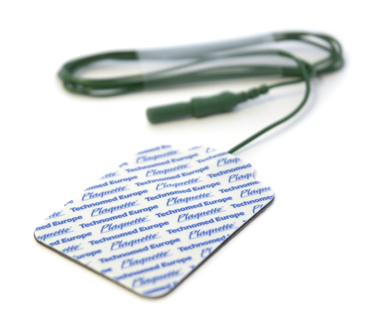 The electrode pad is made of a soft flexible material that minimizes patient discomfort. Sold in boxes of 20 pieces. Single patient use only. Order G1/G2 recording electrodes and ground together. Kit includes one box each of the above K50430-001 (recording) and K50431-002 (ground) electrodes. Enough for 20 patients. Single patient use only. Nerve Conduction Studies - The NeuroLine 715 electrode features a high quality silver/silver chloride sensor for optimal signal quality. The transparent sensor area enables you to locate the examination target area very precisely. The skin friendly solid-gel allows you to reposition the electrode several times without losing the adhesive power. Disposable lead wire attached. Single patient use only. Evoked Potentials - NeuroLine 700s are conductive, self adhesive electrodes with a special "duck feet" design, which ensures that the electrodes stay in place even if the lead wire is pulled. Terminates in a standard touch-proof connection. Sold in packages of 12 electrodes; 3 each of Red, Green, Black and White. Single patient use only. Multipurpose Snap Electrode - The NeuroLine 720 is a self-adhesive electrode featuring a highly conductive wet gel for an instant signal. The strong yet skin-friendly adhesive makes the electrode ideal for sleep registration, as it stays in place during the entire examination, even if the patient sweats. Is also a great EMG electrode. Comes with an offset press-stud for use with snap lead wires. Sold in packages of 25 electrodes. Single patient use only. Specially designed Hydro Gel delivers superior adhesive and conductive performance. Electrode can be reapplied on a single patient numerous times without losing adhesiveness. Ag/AgCl conductive material is 3 times as thick as most disposable electrodes, significantly improving the quality of the recording. Each bar has two electrodes with standard 30mm spacing. Can easily be separated at perforation to create two independent discs. Center mark ensures accurate measurement every time. Requires reusable alligator clips. Single patient use only. Disposable skin temperature sensors are self adhesive for eary use.